Christmas was an opportunity to open some special bottles. Loma Prieta 2009 – Been keeping this for a few months (see http://www.pinotage.org/2011/08/paul-kemp-of-californias-loma-prieta.html ). This is a beautiful wine with soft dense fruit flavours, especially damsons. Just about perfect. I found this more immediately appealing than the 2008 and excellent drinking. Been garlanded in Platinum, Double Golds and Best of Classes in US wine competitions. I’m going to have to visit California to catch up on how they’re mastering this grape. 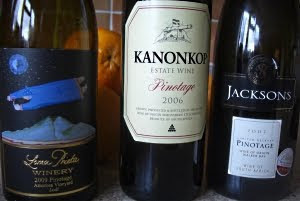 Kanonkop 2006 – intense compact brooding power, albeit restrained. Serious statement wine and beautiful with it. This was a Top 10 winner this year, tho’ I don’t know you can buy 2006 vintage. There’s a lot of sludgy sediment which leads me to think this wines evolving. I have a few more bottles so it’ll be interesting to try again, say next Christmas. Stanford Hills Estate Jacksons 2007 – young fresh fruit flavours, red currants and blackberries from a newish estate in Walker Bay. Clean, lively and refreshing, tastes youthful, it’s a delightful drink. Deservedly 4 Platter stars.